Enthusiastically eating my way around Dublin and beyond. The Old Spot, Bath Avenue. I recently wrote about the small triangle of foodie heaven that is my ‘hood, which has given us such gems of eateries as Foodgame, Juniors, Paulie’s Pizza, Farmer Brown’s and the Chop House. Late this year, this little corner of Dublin was further added to with the opening of The Old Spot, in what was formerly the Lansdowne Pub (does anyone else remember the slightly mad Filipino restaurant that used to be upstairs?) just under the bridge on Bath Avenue. Under the same ownership as Junior’s and Paulie’s, its credentials are strong, but when I read a review by the esteemed Irish food critic, Lucinda O’Sullivan, that was none too favourable, it did make me think twice about visiting. But, mostly based on the owners’ track record, and partly because I don’t think it’s playing fair for critics to review restaurants when they’re so new, I decided to give it a try on one of the last weekends before Christmas, and make up my own mind. The occasion was a visit of The Mammy and Daddy to Dublin, and a plan for Sunday lunch. What better reason to try out the new gastropub on my doorstep, in the hope of a great Sunday lunch like the ones I still fondly remember from living in London a few years ago. London does the gastro-pub thing so well, and on entering the Old Spot, you immediately see that they are trying to bring the best elements of this to Dublin. I immediately found myself beginning to disagree with Ms O’Sullivan’s review, which had described this as “more restaurant than gastropub.” To me, it’s exactly as a London “gastropub” would be, with a small bar area in the front with some seats if you’re just there for a drink, or waiting on a table, and a cluster of tables in the dining room area, allowing the space to function as a restaurant. We were warmly welcomed and instantly loved the decor. 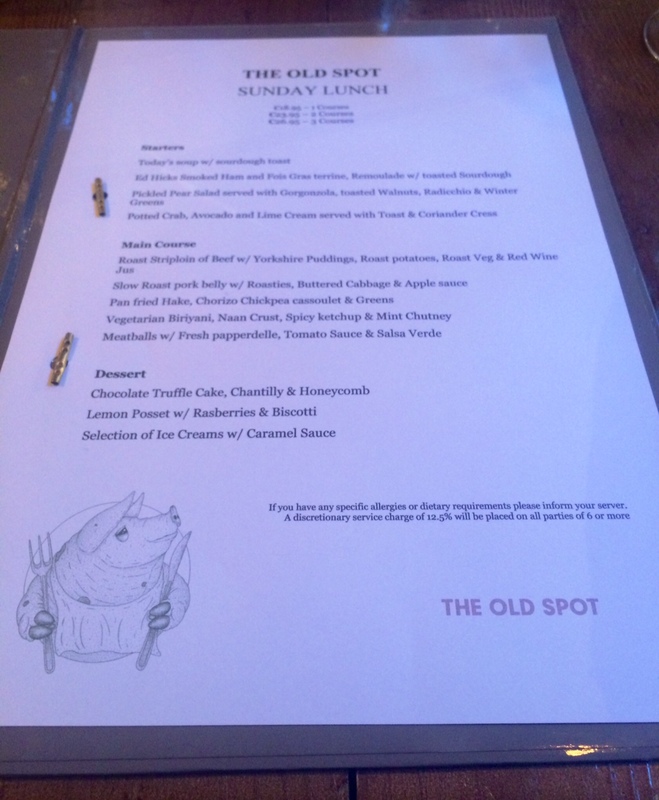 Cosy and traditional, yet with lots of quirky touches, and a soundtrack of mostly 90’s hip hop that saved the ambience from being too old-school Sunday pub lunch. Mammy approved of the comfortable seating – once the friendly waitress had fixed a wobbly leg on our table – and Dad approved of the wine list. All good so far. I ordered a glass of Paddock Shiraz (€7.50) while the parents each went for a glass of Marques Tempranillo (€6.60), and we settled into choosing from the 2-course lunch menu, at €24 per person. But of course, the real test was going to be the food. And from my first dunking of a perfectly charred, chewy slice of sourdough into a bowl of silky, pesto-drizzled celeriac soup, I had a feeling that Lucinda and I were going to differ on this score too. This soup tasted as delicious as it looked, and this was backed up by Dad who was also enjoying a bowl across the table. 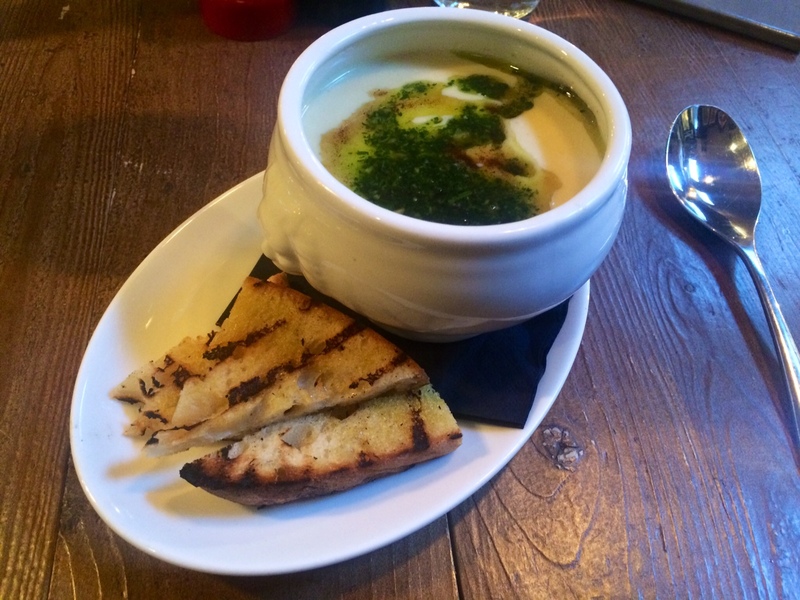 Meanwhile, Mum was tucking into Potted Crab & Avocado with Lime Cream, which was plenty of fresh crabmeat and avocado mushed up in a little glass jar and scooped out with more of the same excellent sourdough toast. We had a bit of a wait for our main courses, as the restaurant began to fill up with other lunchers, but our waitress kept us updated and we weren’t even tempted to be cross when the service was so cheery. Mum and I whiled away the time by rummaging through the shelf of old children’s and classic books that was on the wall behind our table. When the mains did arrive, we were thrilled to see three very large servings of meat presented to our table. Both Mum and I had chosen the special main course of the day, a rib-eye steak at a €5 supplement to the set menu, and they were served with mashed potato, green beans and cafe de Paris butter on the side. I’d ordered green veg as a substitute for the potato, and these came as a generous portion of fresh veg in a cast-iron side dish. 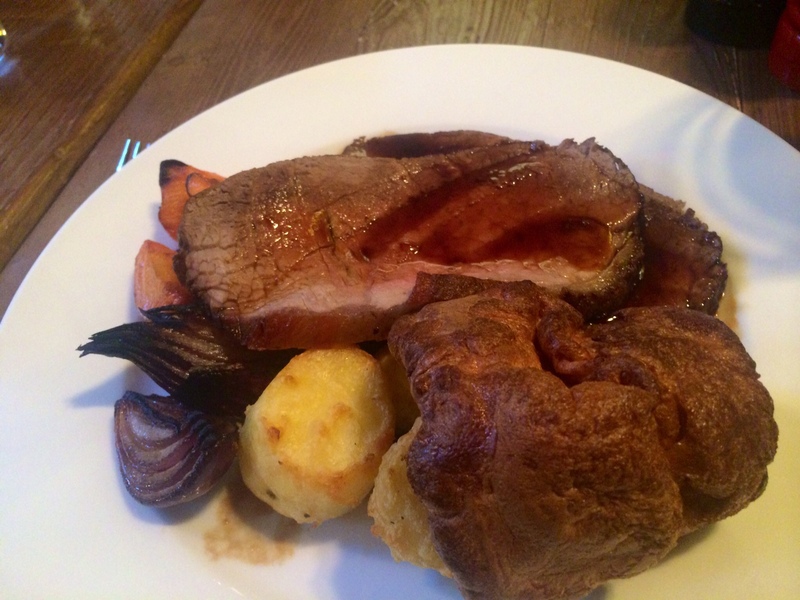 However, the roast beef was a little too rare for my Dad’s liking. Almost bloody, it was taken away by the staff and promptly returned having been either cooked, or re-carved to his liking. A selection of roasted potatoes and vegetables, not to mention a Yorkshire pud the size of his head, kept Dad happy for some time while Mum and I polished off our delicious, juicy-not-fatty, char-grilled rib-eyes. We reluctantly passed on dessert as we were completely stuffed after those 2 courses, and instead finished with some very good coffees as we caught up on all the family gossip. The lunch for 3, including the supplements for our steaks, three glasses of great wine and three coffees, came to €108.10. I’ve since been back for another excellent lunch, a 3-course set menu affair (fantastic value at €30 a head) with a work group on Christmas week, which was flawlessly served up to universal praise from a group of twelve – no mean feat. The evening menus also look pretty exciting, so once the January diet is over I’ll be looking forward to trying an evening visit in the new year. You’d wonder how many restaurants one small corner of Dublin can hold while allowing all to make a profit, but the crowds filling the Old Spot, its sister establishments and the other eateries of the area on a nightly basis suggest that Bath Avenue isn’t at that tipping point just yet. So I’m delighted to respectfully disagree with Lucinda, and say that whether for lunch or evening, the Old Spot is well worth your pennies in the New Year. And with the DART around the corner, The Bath and Slattery’s pubs nearby, it would make a great destination for a night out even if you’re not a local. 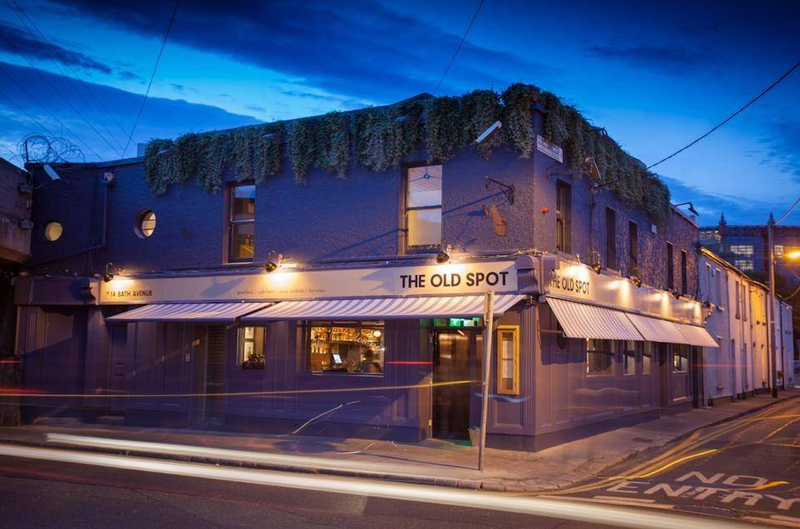 The Old Spot, 14 Bath Avenue, Dublin 4. Tel: +353 1 660 5599. This review is dedicated to my good friend Malachy, who we suddenly and sadly lost on November 12th this year. Mal was always a great man for seeking out the latest and greatest of Dublin’s restaurants and cafes, and the tills of Brother Hubbard, Boojum and the Black Sheep will surely be lighter for his passing. Our hearts on the other hand, will be heavier for a long time to come. The Meeting House, Temple Bar. Blas Cafe, Dublin 1 & Bibi’s, Emorville Avenue.